They’re making their lists and checking them twice. Santa isn’t the only one keeping an eye on you throughout the year. Your health care providers know when you have strayed away from their recommendations, and they are especially alert during the holiday season. Check out these tips for staying on your doctor’s nice list this season. It’s not surprising that one of the top new year’s resolutions is to lose weight or eat healthier. It can be difficult to not overindulge in the feasts and festivities of the holidays. You don’t have to have a goal of losing weight during this time, but maybe consider one of maintaining. Try offsetting any indulgences with a good habit, like going for a walk after every meal. Also, be sure you aren’t skipping meals. If your holiday meals are anything like mine, they can occur at times not consistent with your typical eating schedule. Because of this people often skip breakfast and starve themselves before those meals, possibly in an attempt to not feel as guilty for the amount they will be eating later. Try eating a balanced breakfast, so you aren’t too hungry and end up overloading your plate. 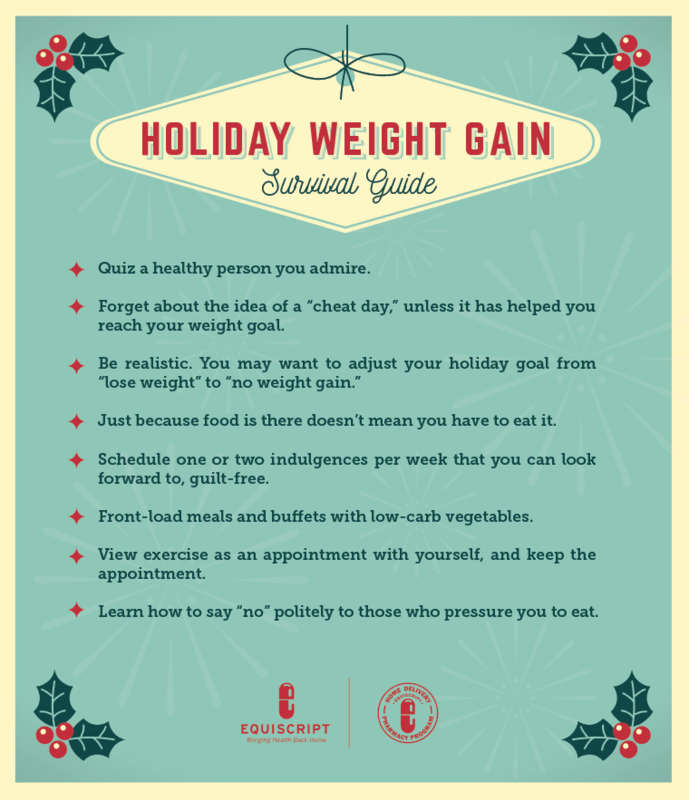 Here are some more tips for avoiding holiday weight gain. Don’t stretch yourself too thin. You will likely get several invitations to attend holiday gatherings for either you, your kids, or grand kids. You will find that your schedule starts to fill up leaving you no time to relax or do the things you want to do. It’s okay to say no to invitations. Your mind and body will thank you in the end. The holidays are a time when germs and sickness thrive. If you’re feeling a little under the weather, it may be a good idea to take it easy and lay low. Your friends and family should understand that you are also looking out for their well-being. You don’t want to put your health or anyone else’s at risk. According to The U.S. Consumer Product Safety Commission (CPSC), in 2012, about 15,000 injuries were seen in emergency rooms across the country related to holiday decorating. While you may have confidence in your ability to string lights with an unsteady chair, get the ladder and have someone spot you. It wouldn’t be a holiday without a little holiday cheer, am I right? While we often associate this time of year with an increase in alcohol consumption, pull in the reins a little bit. If you plan to drink alcohol, eat a sufficient meal beforehand and be sure you are staying hydrated. Make yourself a promise before you go out or attend a gathering. Set your limits and stick to them, and never drink and drive. Some studies suggest that higher mortality rates around the holidays can be a result of patients seeking delayed care. Be sure you are going to your scheduled doctors' appointments or make an appointment during this time to be sure you aren’t falling too far off the wagon. Your doctors want to see you and want to be sure you are remaining healthy and adherent through the holidays. This one may seem obvious but you’d be surprised by how easy it can be to forget it during this time of year. Often times, your schedule gets thrown out of whack and you don’t even know what day it is. Set reminders for yourself to get your medications and to take them on time. If the holidays, for you, mean eating at weird times, remember to plan and adjust for this. Medications often require they be taken with a meal. Consult your care provider about how to plan for this. Traveling? Check out these tips for traveling with your medication.